For those Android mobile gamers out there that enjoy a cracking first person shooter game, you just might like to know that EA Mobile Games has now made Mass Effect Infiltrator available to purchase on Android from the Google Play Store, and is closely related to Mass Effect 3. 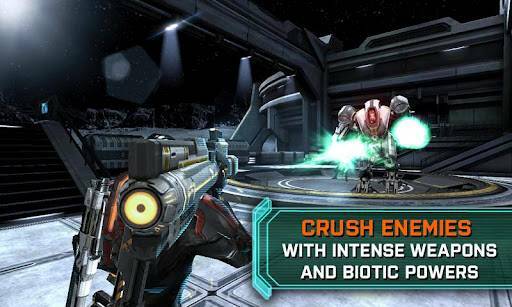 With Mass Effect Infiltrator for Android, the gamer plays the part of the infiltrator, Commander Shepard who battles Reapers across the galaxy, and you have to fight your way out of the hostile Cerberus base, and deliver the secret research to the Alliance. The Mass Effect Infiltrator app for Android offers massive exteriors, a fully resized Cerberus base, intensified audio, a console-like experience, and ground-breaking graphics, with both manual and assisted aiming, and the ability to roll and dive with a swipe. When playing Mass Effect Infiltrator the gamer collects valuable intelligence, which can be uploaded to Galaxy at War to boost the gamer’s Galaxy Readiness rating in Mass Effect 3, whilst completing the game increases the gamer’s War Assets. Mass Effect Infiltrator is quite huge weighing in at 450MB, so you need to make sure you download over WiFi, and before you head off to grab the game, we have a Mass Effect Infiltrator for Android trailer video for your viewing pleasure below, so don’t forget to mash that play button and check it out. For those that wish to give Mass Effect Infiltrator a whirl on their chosen Android device, you can download the game at a cost of Â£3.99 roughly $4.99 by hitting up Google Play.